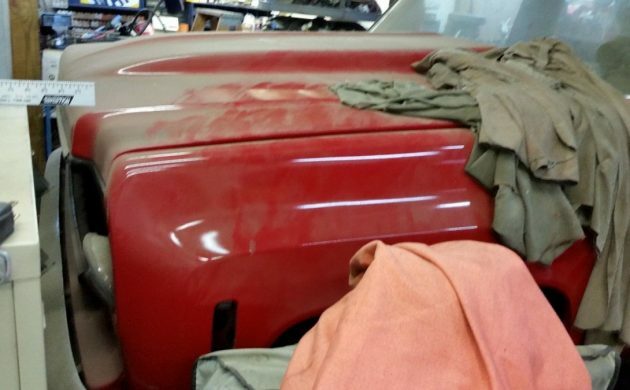 This red, one ton, four-wheel drive dually, 1979 Chevy C3500 is ready for restoration. With a buy it now price of $8,555.55 or the ability to make an offer, you can take this alternative to Santa’s sleigh home from Williamsport, Ohio. The truck has a clear title and 140,000 miles on the odometer. You can view more on eBay. Not many details are listed about the truck and the very few photos that are in the listing do not do it any justice. 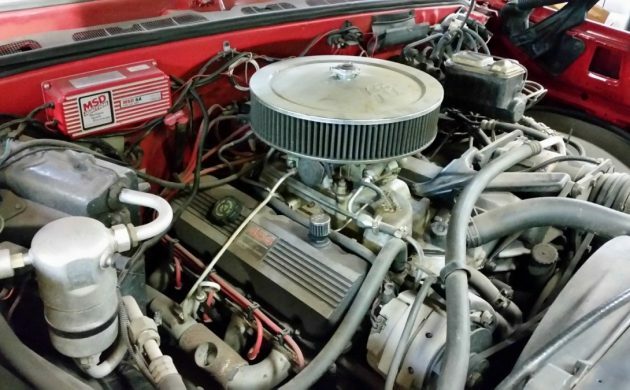 The engine is listed as a 468 cubic inch V8 connected to an automatic transmission. They have it listed as regular gas and not diesel. It does have four-wheel drive but they do not say if the truck runs or drives. Options inside include air conditioning and a claimed cruise control. Besides a lot of dust, the interior is in decent condition. It is one of the few photos that are helpful. There are some aftermarket gauges on the dashboard with no explanation as to why. From all the photos available, the bodywork does not look to be that bad. It is hard to tell if anything is rusted, especially being an Ohio truck, the underside could be a very different story than the surface. There is no indication of any parts that go with the truck. You will certainly want to contact the seller to clarify quite a few things. Sure would be nice to see some actual full-coverage pictures of this unit. A 1-ton dually of this vintage is one good truck. Someone obviously dropped in a crate motor, which is fine except that I’d rather have the original Big Block. You wouldn’t be able to wear it out; this one has to be killed with a stick. Lots of these went through our shop. The only problems we had were transmission failure due to electrolysis. The auxiliary ground from the battery to the front header would break causing the lights to ground through the rear axle and transmission. It really made quick work of those TH trannies. Looks like a restoration project that the owner lost interest in or maybe the funds ran out. Or maybe a customer’s rig that gave it up to the shop doing the restoration. 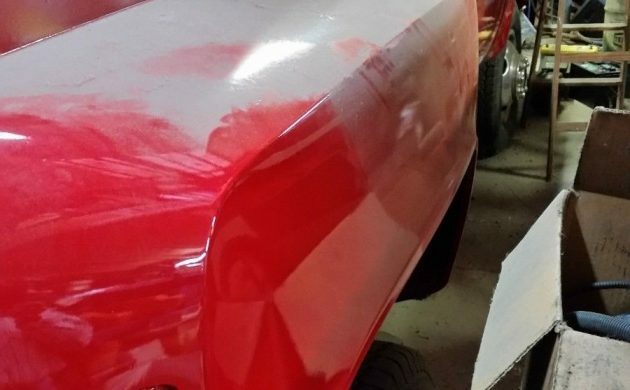 The paint looks really good, it looks like you just have to put the lights, trim and grill back on to finish. It even looks like it has new fender wells and the engine compartment looks refreshed. It sports a rebuilt motor, a cowl induction hood and what looks like fresh paint on the interior of the cab. When you figure in the cost of the paint job and rebuilt motor, it’s probably a good buy at the price. will people EVER learn how to take a picture of a vehicle that they are trying to sell ….. these look like flashbacks of a blackout drunk night …. 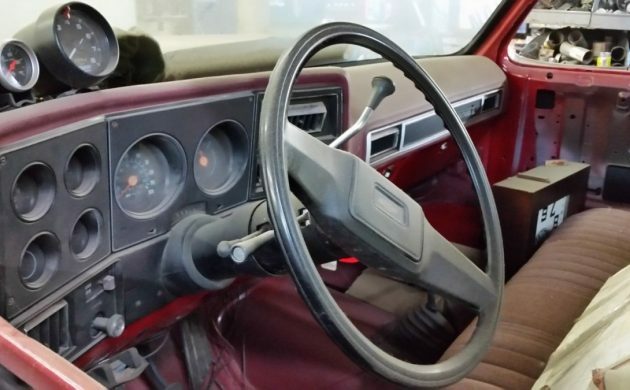 Sounds great – Today from the Queen’s Office @ 203 South Water Street, Her majesty is offering the following crown jewel: 1979 Chevrolet 1 Ton Dually 4 Wheel Drive –Red / Red Interior -New Paint, New body panels, New windshield. 468 motor. 2000 miles since rebuild of motor. Keith Black Pistons, 9:1 Compression, 780 Holley Carb, Edelbrock Aluminum Intake, Comp Cam, Edelbrock Tubular Exhaust. Air conditioning. Truck was parked in barn when brought home after being painted, tail lights, etc. have not been reinstalled but are with the truck. Truck is started every so often to keep the battery up. Good tires. Runs and sounds great! Inspection of the truck is highly recommended before purchase. Great truck just no interest anymore to finish and drive. Why would this seller think this fixer upper, would be worth close to 5 digits? It is not that rare of a truck.